^ Ryusaku Tsunoda and L.C. Goodrich, ed., Japan in the Chinese Dynastic Histories. Pasadena: P.D. and Ione Perkins, 1951, pp.38-42. ^ Charlotte von Verschuer, `Japan's Foreign Relations 600 to 1200 A.D.', Monumenta Nipponica, vol.54, No.1 (Spring 1999), p.30. ^ Ryusaku Tsunoda and L.C. Goodrich, ed., Japan in the Chinese Dynastic Histories. Pasadena: P.D. and Ione Perkins, 1951, p.55. ^ Ryusaku Tsunoda, Wm. Theodore de Bary, Donald Keene, eds., Sources of Japanese Tradition. New York: Columbia University Press, 1958, p.279. ^ a b Michael Cooper, ed., They Came to Japan. Barkeley: University of California Press, 1965, p.76. ^ Engelbert Kaempfer, The History of Japan. Glasgow: MacLehose & Sons, 1906, 3 vols., vol.1. pp.259-260. 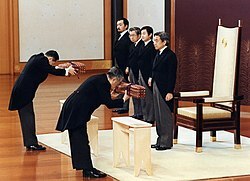 ^ David M. Earl, Emperor and Nation in Japan. Seattle: University of Washington Press, 1964, p.48. ^ Donald Keene, The Japanese Discovery of Europe. London: Routledge and Kegan Paul, 1952, pp.79, 153 n.12. ^ Nitobe Inazo, 'The Moral Basis of the Japanese Monarchy', in The Works of Inazo Nitobe. Tokyo: University of Tokyo Press, 1979, vol.3, pp.498-499.